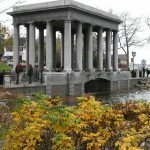 The smallest park in the Massachusetts state forest and park system, Plymouth Rock Portico is also the most heavily visited. Nearly one million people a year come from all over the world to visit the town where in 1620 Europeans first made a home in New England and to see Plymouth Rock where the passengers on the Mayflower first set foot in the New World. This simple memorial on the shore of Plymouth Harbor has become a world famous symbol of the courage and faith of the men and women who founded the first New England colony. The portico, designed by McKim, Mead and White, is comprised of granite columns, iron beams and a Guastavino-tile vault. Vertical Access completed an inspection of the Guastavino vault. 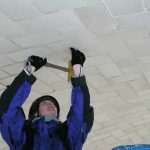 Access to the underside of the vaults was achieved using a Genie lift, which was maneuvered between the columns of the monument. VA observed and noted conditions at the surrounding granite cornice, columns, parapet and at the rubber membrane roof.